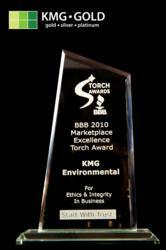 KMG Gold Recycling, the only gold buyer in North America to win a Better Business Bureau Torch Award, has won its second award in as many years. Better Business Bureau Torch Awards recognize businesses that build trust, advertise honestly, tell the truth, remain transparent in their business dealings, honour their promises and display integrity in all of their marketplace activities. KMG Gold Recycling buys, recycles, and refines all precious metals including gold, silver, platinum and palladium. KMG started as an internet gold buyer in 2007 on http://www.kmggold.com, and opened their retail location in Winnipeg in 2010. Since 2007, KMG has served thousands of customers from all across North America and has paid out millions of dollars for gold. Michael Gupton, President of KMG Environmental Inc. which operates as KMG Gold Recycling said these were the same principles that he used to develop his successful business model, long before he had ever heard of the Torch Awards. ?This is a great honor to win a BBB award in the very predatory gold buyer market. KMG is the very best,? Gupton says. BBB Torch award winners are nominated by their customers and selected as winners from a panel of distinguished judges at the Better Business Bureau. ?KMG Gold customers nominated us for this award; our commitment to trust and ethics and our dedication to our customers make us winners,? Gupton says. “Our website http://www.kmggold.com has become a trusted source of industry information, not only for the general public, but also for other industry participants,? says Gupton. Consumers are beginning to realize that the process of recycling precious metals is not that complicated and that there are simple steps to take to guarantee that the consumer receives top dollar for their precious metals. The simple fact is that all gold to be recycled, all precious metal ends up at a refinery. The more people, or middlemen, that touch precious metal on its way to the refinery, the less money the consumer will receive. The obvious solution to get top dollar for precious metal is to cut out the middlemen and deal directly with a refinery like KMG Gold. Co-founded in 2007 by Gupton, a graduate Civil Engineer and registered prospector, KMG Gold is recognized as Canada?s leading authority on recycling gold and silver jewelery and other precious metals. As a functioning refinery and not a middleman, KMG Gold is able to pay more to consumers and businesses wanting to recycle their unwanted precious metals. This has been confirmed by numerous independent third party surveys including CBC News. KMG has been recognized for advocating on behalf of the consumer and pushing for more transparency in the marketplace through public education. The KMG Gold website has become a valuable resource for those wanting to learn more about the industry. KMG works closely with the Canadian Cancer Society and Canadian Goodwill Industries, helping in raising funds for research and creating jobs. For more information on KMG Gold, please visit http://www.kmggold.com, or call us at 204-452-4653, or toll free at 1-877-468-2220.